Hickory Furniture TV Room Trivia: In the old days, baseball bats were made of? Hickory! 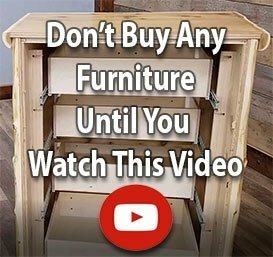 Whether you’re looking for rustic log furniture for a TV room, living room, game room or den, it’s fun to know its origins. In the old days – before Woodland Creek’s was crafting cabin decor hickory TV stands and rustic decor hickory occasional tables – hickory was the hardwood baseball bat makers turned to. Its hard, stiff, shock resistant properties continue to make it a big “hit” today! Who doesn’t like a generous helping of history with their western decor wood furniture? Know what’s even more impressive than hickory baseball bats? The fact that hickory was used in the construction of early aircraft. No wonder rustic decorating with hickory sofas and chairs always puts us on cloud nine! And why wouldn’t it? At Woodland Creek’s, we love the historic charm that’s built into each bit of durable reclaimed wood furniture and country decor rustic furniture we sell. It’s not the absolute hardest wood in existence, but hickory’s strength, toughness and firmness have earned it a reputation as a unique triple threat among wood types. We harvest its best attributes to bring you hard wearing cottage furniture – as well as home, lodge and cabin log furniture – that nicely compliments country decorating efforts in the game room, lobby or den.